Chris Janson Fan Party On Sale Now!!! 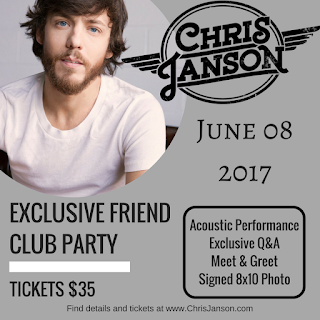 Join hit singer/songwriter Chris Janson for his annual FRIEND CLUB PARTY during CMA Fest. Each ticket purchase includes: Acoustic Performance, Exclusive Q&A, Meet & Greet, and a Signed 8x10 Photo. Click here to see our complete list of 2017 CMA Fest Fan Club Parties!